This is custom premium and strongest bilateral uprght elbow brace by Donjoy. The carbon ﬁber frame in conjunction with bilateral polycentric hinges provide support for medial/lateral ligament instabilities and hyperextension control. 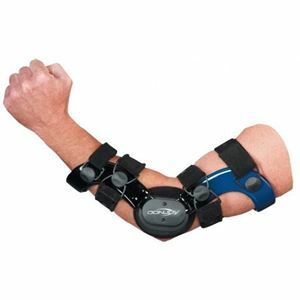 The hinges have adjustable flexion/extension stops to address individual range of motion protocols and restrictions and provide protection in even the most physically demanding sports. Includes patented supracondylar pad medially and air condyle pad laterally for comfort and to prevent migration. This is a custom made edition. Cast must be 16" in length (8" above and below the elbow) arm should be in 15 degrees flexion. Measurement is the minimum diameter from elbow joint.